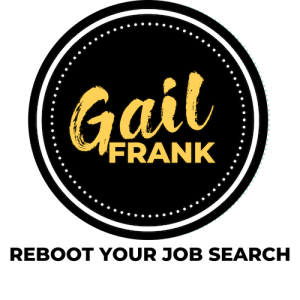 Gail Frank is a career services professional who offers outplacement workshops, resume writing, and interview training for individual job seekers and small companies. She is passionate about teaching women the job search skills they need to land the job they deserve, without feeling isolated or stressed. Audience members find her to be an engaging and funny speaker who gives motivational talks/keynotes and informative workshops to groups, clubs and associations. Participants walk away from her programs with a renewed sense of energy, a fresh perspective, new information, and a roadmap to take action. With her insistent thirst for knowledge, she went after a masters degree in Adult Education/Corporate Training and spent 10 years as a trainer and consultant for global outplacement firm DBM. She then was asked to create and deliver high-power “Job Search Webinars” to unemployed professionals via RiseSmart’s national outplacement programs. These highly-praised webinars tackled tough job search issues such as networking, salary negotiation and career fairs, and brought them to life with amusing yet informative stories and action-oriented comprehensive workbooks. In 2010, she was inducted in the Lowell High School Athletic Hall of Fame in her hometown of Lowell, Massachusetts. Singled out for her talent, leadership, enthusiasm and results in swimming and track & field, and Harvard College varsity letters in water polo, Gail Reynolds Frank joined 20 other women and 109 men in this elite club. Gail lives in Tampa with her husband Gary and their two furiously cute kids, Sarah and Ryan. In between finding fun new ways to enjoy motherhood and helping clients, she tries very hard to squeeze in time for reading and swimming laps. If you aren't getting interviews and responses to your resume, it's likely due to the most common problem I see as a certified resume writer. Grab this Microsoft Word cheatsheet with tons of examples to fix the #1 problem with your resume. Totally free and I walk you through HOW to fix it! Success! Now check your email to confirm your subscription. I will be adding lots of online job search training in 2018, including free trainings on popular topics. But you have to confirm your wish to be on my list so head over to your email now and click on the link! Thank you, together we will have fun and you will be able to craft a great job search in 2018. I'd like to receive the free "5 Steps to Fix the Worst Resume Mistake" Cheatsheet.